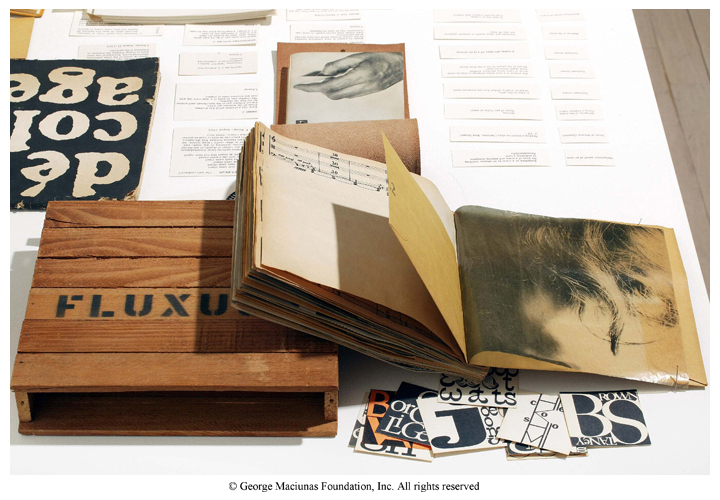 George Maciunas’ choice of the word Fluxus, in October 1960, as the title of a magazine for a projected Lithuanian Cultural Club in New York, was too good to let go when that circumstance evaporated. In little more than a year, by the end of 1961, he had mapped out the first six issues of a magazine, with himself as publisher and editor-in-chief, that was scheduled to appear in February 1962 and thereafter on a quarterly basis, to be titled Fluxus. The projected magazine might well have provided a very interesting overview of a culture in flux. Maciunas planned to include articles on electronic music, anarchism, experimental cinema, nihilism, happenings, lettrism, sound poetry, and even painting, with specific issues of the magazine focusing on the United States, Western Europe, Eastern Europe, and Japan. Although its proposed contents reflected a contemporary sensibility, its emphasis on the publication of essays on those topics suggests that the magazine would have been relatively conventional in presentation. But the seeds of the actual Fluxus magazine that was eventually published were nonetheless present, even in the first issue of the projected magazine, since it was intended to include a brief “anthology” after the essays. 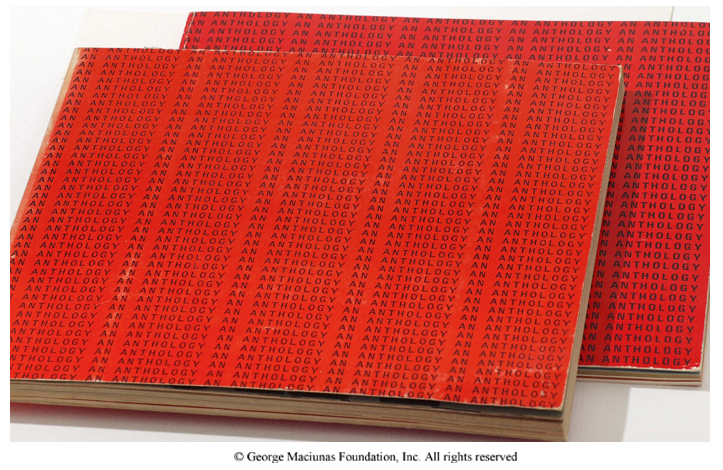 This proposed anthology would have drawn on the contributors to La Monte Young’s publication An Anthology, the material for which had been amassed in late 1960 and early 1961, and which George Maciunas had been designing since the middle of 1961. In fact Fluxus was “supposed to have been the second Anthology.” But the anthologized works projected for the first Fluxus were radically different from the articles, since they were printed artworks and scores—as were most of the pieces in An Anthology, which was finally published by La Monte Young and Jackson Mac Low in 1963. When George Maciunas consulted his dictionary he found that the word “flux” not only existed as a noun, a verb, and an adjective, but also had a total of seventeen different meanings. 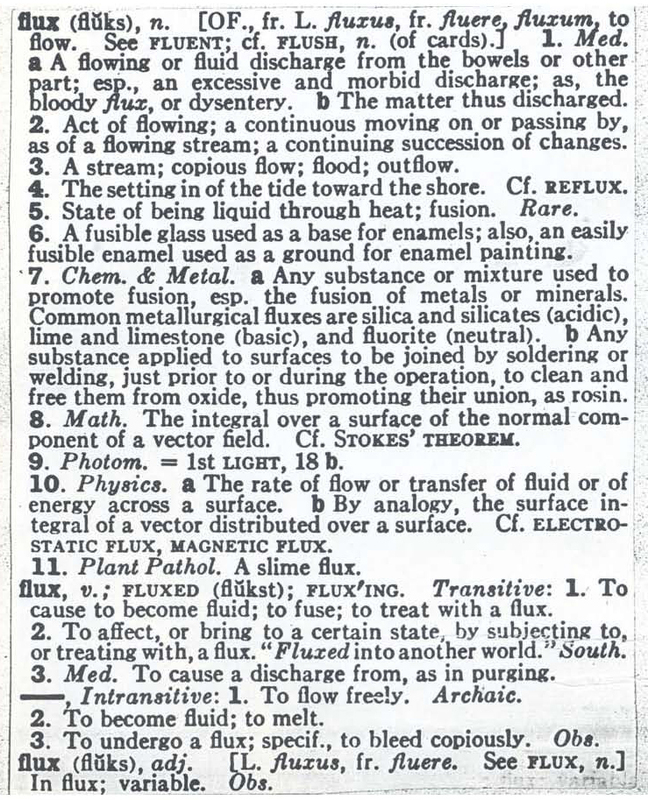 At the head of his Fluxus…Tentative Plan for Contents of the First 6 Issues, issued late in 1961, he rearranged five of these definitions to explain the use of the term Fluxus, bringing to the fore the idea of purging (and its association with the bowels). By 1963, these selected dictionary definitions of “flux” could no longer encompass the developing intentions of Fluxus, and Maciunas began to promote three particular senses of the word: purge, tide, and fuse—each not amplified by his own comments. These amounted to new working definitions of the three senses, and were refined to the point where they could finally be incorporated into a collaged, three-part Manifesto, together with photostats of eight of the dictionary definitions. The aims of Fluxus, as set out in the Manifesto of 1963, are extraordinary, but connect with the radical ideas fermenting at the time. The text suggests affinities with the ideas of Henry Flynt, as well as links with the aims of radical groups earlier in the century. 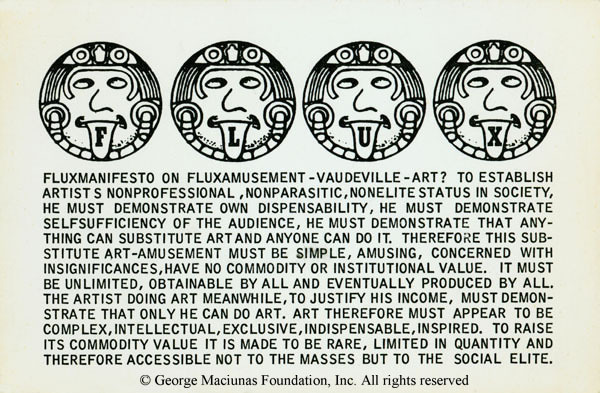 The first of the three sections of Maciunas’ Manifesto revels that the intent of Fluxus is to “PURGE the world of dead art…abstract art, [and] illusionistic art…” What would be left after this purging would presumably be “concrete art,” which Maciunas equated with the real, or the ready-made. He explained the origins of concrete art, as he defined it, with reference to the ready-made objects of Marcel Duchamp, the ready-made sounds of John Cage, and the ready-made actions of George Brecht and Ben Vautier. 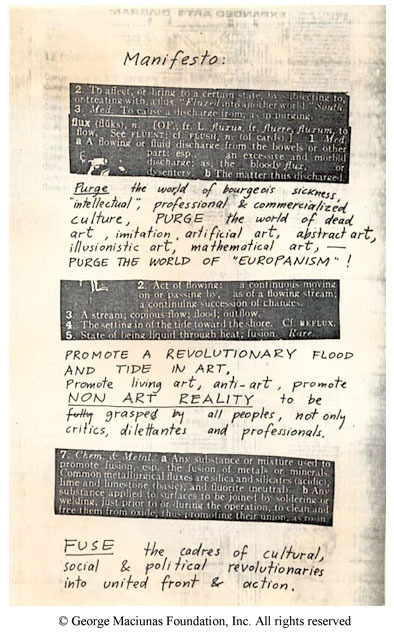 The last sentence of this section of the Manifesto reads: “PURGE THE WORLD OF ‘EUROPANISM’!” By this Maciunas meant on the one hand the purging of pervasive ideas emanating from Europe, such as “the idea of professional artist, art-for-art ideology, expression of artists’ ego through art, etc.,” and on the other, openness to other cultures. The composition of the group of Fluxus people was exceptional in that it included several Asians, such as Ay-O, Mieko Shiomi, Nam June Paik, and Yoko Ono—as well as the black American Ben Patterson and a significant number of women—and in that it reached from Denmark to Italy, from Czechoslovakia through the United States to Japan. Maciunas’ third section was “fuse,” and read: “FUSE the cadres of cultural, social & political revolutionaries into [a] united front & action.” Inevitably most of Maciunas’ time was spent trying to fuse cadres of cultural revolutionaries, though not all the Fluxus people saw themselves in this way. One of his tactics was the employment of the term Fluxus beyond the title of the magazine as a form of verbal packaging, whereby Fluxus people would benefit from collective promotion. However, in spite of these beginnings, one might say that ultimately the purest form of Fluxus, and the most perfect realization of its goals, lies in performance or, rather, in events, gestures, and actions, especially since such Fluxus works are potentially the most integrated into life, the most social—or sometimes, anti-social, the obverse of the same coin—and the most ephemeral. And they are not commodities, even though they may exist as printed prescriptions or “scores.” But when such scores and other paraphernalia are encountered in an exhibition, rather than activated and experienced through events, a vital dimension of Fluxus is missing. There are some Fluxus works that can be experienced simply by looking, because they work visually, and there are others that can be performed by an individual as mind games. But many more works require that they be performed through physical activity by one or more persons, with or without onlookers. When works or scores such as these are seen or read in an exhibition, experience of them can only be vicarious. 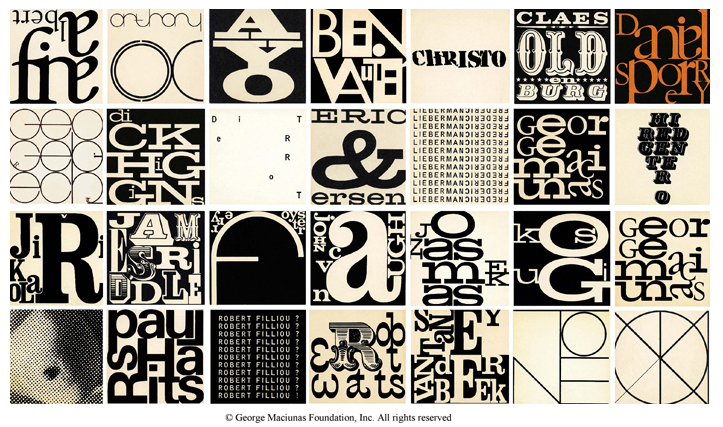 Although Maciunas himself, even by 1973, was referring to the years 1963-68 as the “Flux Golden Age,” Fluxus concerts, publications, and so on, however “transitional,” actually lasted more than “a few years,” for Fluxus did not come to an end until the death of George Maciunas in 1978. By that time the exact composition of the Fluxus group had changed many times: some had left early; some had returned; others had arrived late. A few Fluxus people and neo-Fluxus people believe Fluxus is still a flag to follow, while others believe that “Fluxus hasn’t ever taken place yet!” George Brecht may have put the matter to rest recently, when he declaredthat “Fluxus has Fluxed.” But the elusive sensibility that emerged from a world in flux in the late fifties and early sixties, and which George Maciunas labeled Fluxus, has weathered the seventies and eighties and is fortunately still with us. Today it goes by many names and no name, resisting institutionalization under the name Fluxus even as it did while Fluxus packaged pieces of it decades ago.